I've been having some bloat issues with one particular clay body. It's a buff cone 5/6. It's made by the ceramics store I use here in southern cal. Here's the scoop: When fired previously up to cone 5, there was zero bloat but I wasn't too pleased with my glaze results (Amaco's potter's choice - not in attached photo) so I fired up to cone 6, and first had the bloat. 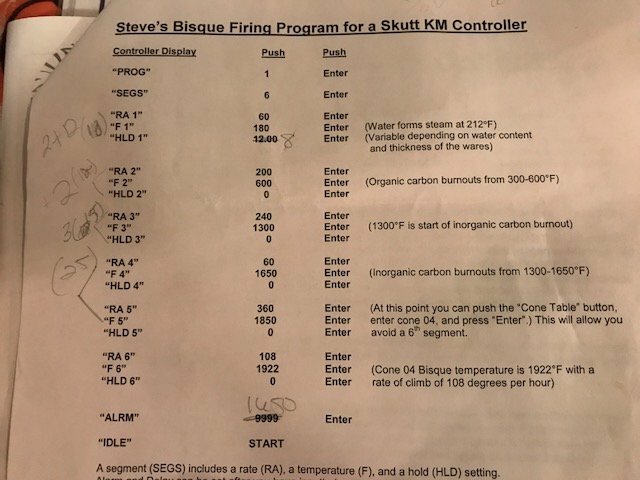 I called my clay shop and spoke to their clay-kiln guy (lovely and helpful) and he gave me his custom bisque program that he said would help with specifically with inorganic burnouts (he said something about iron?) that can happen with darker clays. Again, this is a buff, not something as dark as Black Mt. but he said this was the issue. Then I fired the next batch using the nifty bisque program to cone 6 and soaked for 10 minutes. The only modification I made was to do 8 hours in the candling phase instead of 12 as written, because I know my pieces are bone dry before I load my kiln. I was very hopeful for this next batch until... bloat again! We spoke today and he still believes the iron is the issue, but I'm unsure of what to do next. Do you think this clay isn't stable at cone 6? I know there isn't technically a huge difference in temp between cone 5 and 6 but I'm tempted to take some old bisque pieces that I have stored away and test them at cone 5. That brings us back to the issue of glaze maturation and so I'd like to let the pieces soak at cone 5 -- how long do you think is adequate? Could cone 5 and a long soak be the solution? I adore throwing this clay body, and I really feel like my throwing skills have improved due in part to the nature of this clay, so I'm hoping that I can figure this out and keep using it... plus I have at least 200 lbs of it sitting on a shelf in my garage that I'd hate to not use. I've attached one of my bloated pieces and the bisque program I used during this process. Please excuse my pencil scribble on the firing program... I was trying to figure out total firing time so I could drop the lid at the appropriate time. **my matte white glaze also made by my local store appears underfired? over fired? So many issues for this newbie. 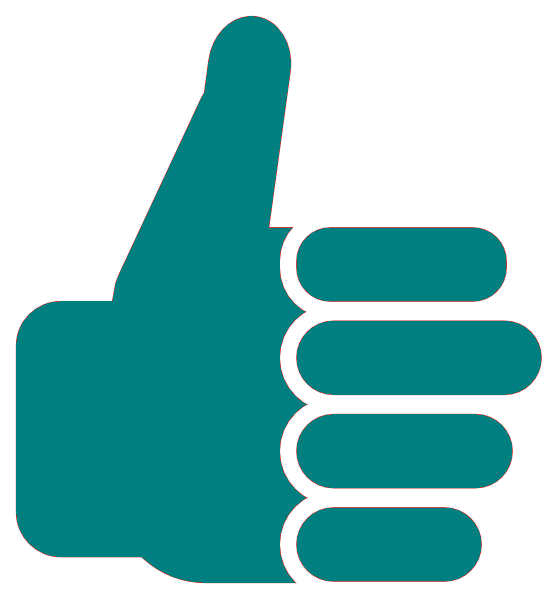 If you're still reading this... thank you! I truly appreciate the wisdom of this group! not sure.. You are bisquing to cone 6?Then glaze firing to cone 6? If so your clay would be overworked. Ok reread and I'd add a hold 15 mins at cone 04. 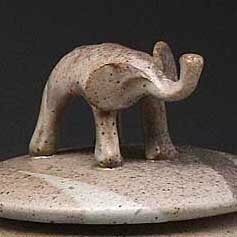 Have you seen your glaze fired on other clay, or anywhere else? can get pretty matte mattes, but your glaze looks a bit thick maybe. what is your glaze firing schedule ? I'm not saying it's impossible, just saying that in all of my years in working with this forum, I've seen countless questions regarding the problems that happen at the top end of the glaze firing (bloating and pinholing), and I have never once seen the problem solved with a different bisque schedule. I have often seen the problem solved by pinpointing the correct temperature for the top of the glaze firing. I experienced a similar problem myself a few years ago when I switched claybodies. The new clay made one of my glazes pinhole. Someone suggested that I extend my bisque firing to "burn out the impurities" and it didn't make any difference. The solution to my problem was to reduce my firing temp from cone 6 to cone 5.75. In other words, 0.25 cone can make a difference! So the difference between cone 5 and cone 6 is technically huge. The problem here is very simple, cone 6 is too hot for this clay. You are bumping into the limit of what you can do with commercial glazes. Your glaze wants cone 6 and your clay wants cone 5, and you can't alter either. You have three choices: (1) find a new glaze that works at cone 5, (2) find a new clay that fires to cone 6, or (3) enter into the world of making your own glazes, where you can learn how to tweak a recipe to meet your needs. I recommend 3. It is a huge subject with a long and high learning curve, but worth it! Edit to add: I just noticed your idea to try firing this clay/glaze combo to cone 5 with an extended hold. Yes you can try that, and it might work to mature the glaze without bloating the clay. Try holding up to an hour. But still, be prepared to let go of this clay/glaze combo if it doesn't work. I think much of what Mea says is spot on. The only thing I would dispute is that there are times when a modified bisque will correct some problems. . . ie. years ago I threw some large covered jars with a new clay body that was white. After a proper bisque that was exactly as I had used with two other clays, I opened a kiln to find a load of pottery with spiral cracks going up the entire pot. Yep in everyone of them. The crack would start an inch from the base or so, go up the put to the rim, sometimes not reaching the rim. Strangely enough the crack would have an open gap in the middle of the pot that was 1/2 an inch wide. So I tried the next load with a to normal, and then fired down below 1000F. and that worked. Pain in the neck, but it worked. Some things have to be attributed to the bisque, and in some things . . . the clay and the way the potter throws. Thank you! I just reread my post and I didn't add that I bisque fire to 04. I get the feeling that they don't want to admit this clay doesn't like cone 6 because I suggested that and the idea was always shot down. I love the idea of mixing my own glazes but oh boy is that intimidating! Can you recommend a good book or DVD to begin? I agree with everyone else that it's just going too hot. Get rid of the hold, for starters. You're going to 6+ with it. Also, there's absolutely no benefit to an 8-12 hour preheat unless your pots are really wet, or really thick. If they are bone dry you can skip that first segment altogether. If they're a tiny bit wet, a 2-3 hour preheat will do it. If you just trimmed them, 6-8 hours will do the job. Mastering Cone 6 Glazes, by John Hesselberth and Ron Roy. It's out of print, but you can buy digital copies online. The Ceramic Glaze Handbook, by Mark Burleson. I've heard good things about John Britt's latest book on mid-range glazes, but I don't personally own it. Can I ask if you use witness cones to verify your kiln firings? I had a peek at the Ardvark clay page at they say cone 5/6 so kinda wondering if you are firing hotter than you think you are. I didn't know this thread was here Min on the same topic ..... but yes, as to your comment on the other thread....... we posted the same though at the same time. I put hold at end of bisque to provide uniformity of heat throughout kiln as my kiln has colder areas and I pack pretty densely. As the true nebwie I am, I used a self supporting cone for my test fire to 04 and it was spot on, and then proceeded to never use one again. I need to go buy some 5 and 6 cones bc I know (even as the zygote I am) that my kiln is firing cooler at the top. I was going to start a new thread for this question but if you're still reading... I have a Skutt KM 1027 - 3 (only 9 firings so far) and it has a latch on the side that supports the lid at 3 levels for venting. They advise you to you this and to use the lowest level to close the kiln. However, I noticed that it isn't 100% flush when I latch the lid. I can't see fire through it, and I couldn't even measure the opening it's so small, but it's not flush. I thought perhaps this was intentional for oxygen flow, but now I'm thinking I just drop the lid and say to hell with this latch when glaze firing. thoughts? Also, Min, can I just say how appreciative I am that you went to the Aardvark site and had a look? Thank you for such kind, thorough support. Sending you all the virtual hugs. **they say this clay can go to cone 6 and an employee mentioned that there wasn't THAT big of a difference between cone 5 and 6, but I'm learning that isn't always the case. I love this forum! I'd post this on the equipment and repair where the kiln whizzes will see it faster. I would definitely use cone packs on every shelf while you learn how your kiln fires. The cone you fire to would be the middle cone plus one below and above it, so if you are aiming for 6 then use 5,6 and 7. At one point, we were all beginners and newbies. Min and the others have given some good advice. On your bloating, does it happen throughout the kiln, or just top, bottom, or middle? Does your kiln have one thermocouple or three? Sounds like one -- which means your kiln controller is measuring its firing temperature at the middle of the kiln (also called one zone). To compensate for unevenness in temperature, the manufacturer will alter the elements for top and bottom to heat differently than the middle -- all part of their design to even out the firing. A kiln with multiple thermocouples typically measures top, middle, bottom and adjusts element heating accordingly. The cones will tell/confirm where your cool spots are. Then comes the fun part of figuring how to load your kiln to balance the heat and reduce/minimize the cools and hot spots. 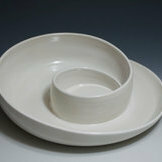 For bisque, if you are firing bone dry wares, no need to keep the top open -- especially if your kiln has a vent system. If no vent, some leave the kiln top slightly open, then drop it at 1000F. That allows any steam from physical and chemical water to escape. When I fired kilns for a community studio, we did a preheat because we were dealing with a wide range of work, some thick, some thin, some bone dry for weeks, some on the shelf that morning. That was a precaution for us. In my own studio, I know my work is dry, no preheat. For glaze loads, drop the top. My kiln top rises slightly during firing (1/8 to 1/4 inch) because air in the kiln expands as it heats. That is normal. If the lid does not sit flush when not on, or rises a lot -- more than 1/2 inch, you will need to adjust the hinge -- as Min suggested. I think ditching the clay is the best option. I had a similar locally-made cone 5/6 buff clay that bloated even worse than yours at cone 6. I was trying out at least 10 other cone 6 clays and did not have any issues with any of them. tried different bisque tricks and it did not help. I stopped using it, but the small amount of it in the mixed trimmings continued to haunt me for months. The clay might have worked at cone 5, but my other clays and glazes were all great at cone 6 and the only advantage of this bloaty clay was that it was a couple cents cheaper per pound. Not worth it.